This is a very professionally done, 1/2 hour documentary. It was called The Nation's Station and was started by Powel Crosley, a grand innovator of products and services from radios to automobiles. In the foreground is a cooling pool which was once used for the 500 KW transmitter. The leftmost building is the transmitter plant building and the house to the right was, at one time, the transmitter plant of WSAI, but now is the residence of the CE and his family. The base of the WLW tower is visible on the right. The transmitter plant houses five operational 50KW transmitters and all of the original cabinets of the original "superpower" 500KW transmitter. The newest transmitter is a Harris 3DX, which is completely solid state. To the left: The WLW antenna is an 747 foot Blaw-Knox vertical radiator. The middle of the tower was made wider (35' square) for additional structural strength. It has been in use since 1933 and supports a total stress load of 450 tons, including 135 tons of structure steel (900,000 lbs)! cooled and operates very quietly compared to a blower cooled transmitter. After replacing a tube in the RF exciter that had failed sometime in the last month or so, the transmitter came up just fine. I put it on the air at 10:45 PM the 31st of 1999 and operated it till 12:15 am January 01,01,2000. Using a modern audio processor(Orban 9100) to modulate the rig with. It sounded fine and the news department mentioned the fact that we were operating on it in their news casts. I seemed fitting that the transmitter that carried information from the depression era, W.W.II, Korea, Vietnam, man landing on the moon, Kennedy's assassination, FDR's passing, and Nixons impeachment usher the station into the year 2000. The transmitter was taken offline as a main transmitter in 1975 when a Continental 317c1 was installed to operate in main service. WLW Revisited 1998 - New tower! More pictures, text and illustration excerpts 500KW from transmitter manual! Over 25 new photos! "Special WLW Cover of Antique Radio Classified 100th issue"
"More WLW/Powel Crosley Related Pages"
My sincere gratitude goes to Engineering Manager, Paul Jellison - WD8KMX, who spent hours giving me a tour of the site. I am also grateful to Jacor VP of Engineering, Al Kenyon, for responding to my Usenet posting, giving me the go-ahead for this tour; and for additional technical information! I am also very greatful to Mr. Randy Michaels, CEO of Jacor, Inc. for his influence in the preservation of this site. Thanks also to Pete Tauriello, Shadow Traffic reporter for WINS 1010, NY, for telling me that WADO also used a Blaw-Knox tower. (The WADO tower has been replaced on 10/17/1999.) Thanks to J.T. Anderton, VP/Managing Director of Duncan's American Radio, for his informative piece on Blaw-Knox towers and other WLW information. John Byrns sent me a good portion of the technical operation details of the 500KW transmitter. Thankyou, John, for your important information. Thanks, also to Barry Mishkind and John Price who wrote articles on WLW (See other WLW related pages at the bottom). Additional information may be added to this page as time goes on. Corrections or additional facts are welcome, especially from anyone who is or has been associated with WLW or have experience with this equipment. Please visit the section "MORE WLW/POWEL CROSLEY RELATED PAGES" for other related links. These photos were taken by both my wife, Gretchen, and myself at the WLW transmitter site in Mason, OH on August 14, 1997. For photo buffs, I used a Cannon AE-1 35 mm camera with a 35-135 mm zoom and my wife, Gretchen, used a Canon G-III semi-automatic with 40 mm lens. For flash shots, we both used Kodak Gold 100 film. I used one roll of the new Kodak Gold MAX film pushed to 1600 speed, which came in handy for natural light shots. This is a private, non-profit page created by Jim Hawkins - WA2WHV, who is not affiliated with WLW. For inquiries about this page, please visit my FAQ page. 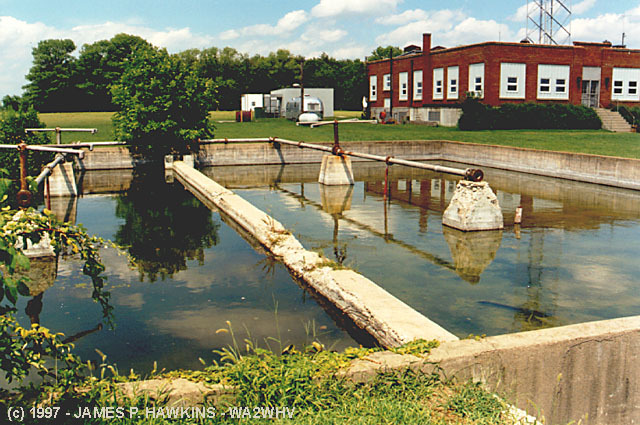 Full view of pond once used to cool the transmitter tubes. Water was sprayed into the air as fountains. Frogs and other life now make their home in this pond. View through wall around base of tower showing insulators which support 900,000 lbs! In addition to a lifelong interest in AM tower sites and coverage, I have been fortunate to have had the opportunity to do more than two years of research in the internal technical file room of the FCC, to gather technical data for my series of coverage map atlases, published by Duncan's American Radio. In addition, I visited more than 2,500 stations in all parts of the country during an 11-year stint as a regional manager for the NAB. I have also photographed more than 1,000 tower sites over the past 20 years. I have talked with radio people and engineers in all parts of the country, and also have had the chance to cross-check the heresay and folklore at the FCC. Given that these towers are so unique, I'm fairly confident that if there are more, I would have come across them by now. I didn't go into this detail to brag, just to establish that I might be a reasonably reliable source. WHO in Des Moines had one until the late 1940's, when it was replaced at the same site by the existing uniform cross-section tower. The bottom two-thirds of the old WHO tower was moved to the rear of an Iowa State Police station in Des Moines for use as a communications tower. These towers are a special part of radio history. I have visited all of them, and they do make quite a visual impression. Most uniform cross-section towers all but disappear visually against many skyscapes, but not these. Their mass stands out against any color of sky, often resulting in strong visual images. The WLW tower, with the call letters lighted in white at the mid-way point, makes a strong visual impression, especially at twilight. 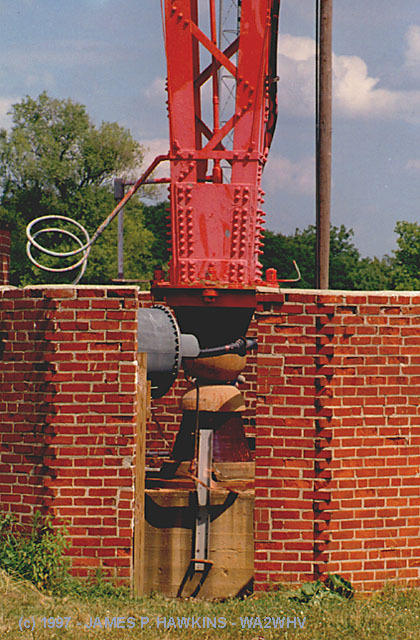 All five of the 50-kw transmitters ever used by WLW are still in place at Mason. All five are licensed and capable of full-power operation, including the original water-cooled 1927 Western Electric. This unit was the first 50-kw transmitter to be licensed in the United States. In the 1980's, the engineering staff of then-owner Jacor Communications restored this transmitter to it original operating condition, using parts left on hand by the engineers of longtime owner Crosley Broadcasting. Randy has a strong sense of the importance of the WLW Mason site in radio history. I hasten to add that WLW is no relic. It is a living, breathing, 100% local, full-service, ratings and revenue dominant AM radio station (a rarity in this era). According to our Duncan revenue estimates, it is the highest billing radio station outside of the largest markets. This was originally the Temple, Cincinnati Lodge No. 5, B.P.O. Elks, designed by the Architect, Harry Hake Sr. (my father-in-law's boss). It later housed WLW studios and was named "Crosley Square," which is inscribed over the front door. I took this photograph on August 13, 1997. March 2, 1922- A broadcast station license for the call letters WLW was issued by the Radio Division of the Bureau of Navigation, U.S. Department of Commerce to the Crosley Manufacturing Company authorizing 20 watts of power on 833 kilocycles. The company, which manufactured "The Harko" radio receiving set, was owned by Powel Crosley Jr. who was to be WLW's sole announcer and technician. August 18, 1922- WLW moved from Crosley's home to his new factory building at 1625 Blue Rock St. at B & O right-of-way and was authorized to increase power to 200 watts. September 1, 1922- WLW began using a newly-installed Western Electric 1-A transmitter, raising the power to 500 watts and changing the operating frequency to 970 kilocycles. For an antenna, the station used two 125 ft. toweers, supporting a 140 foot 12 wire "T"-type antenna. June 7, 1923- WLW began sharing time on 970 kilocycles with a new Cincinnati station, WSAI. The air slogan used was "Queen City of the West". 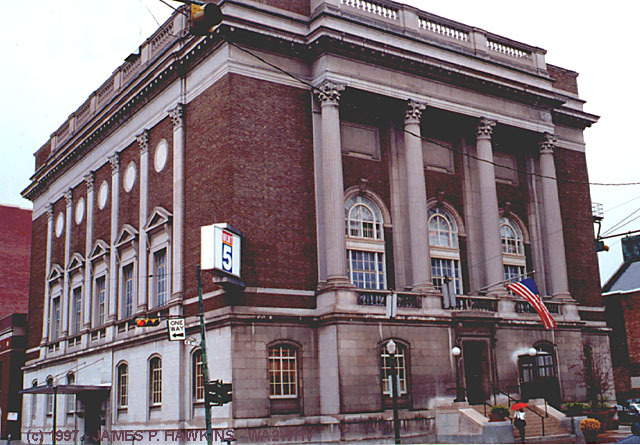 Early 1924- WLW used the air motto "The Station With A Soul", moving to new quarters at 519 Alfred Street, Cincinnati and raising power to 1000 watts. May 1924- WLW changed frequency to 700 kilocycles, but was later shifted to 710 kilocycles to make room for WBAV of Columbos, Ohio. WBAV was re-assigned elsewhere on the dial, later that year. January 1925- Remodeled, spacious studios were opened at the Crosley factory. WLW was then granted permission to raise power from 1000 watts to 5000 watts. January 27, 1925- WLW installed a new 5 KW transmitter at Harrison, Ohio where two 200 foot tall towers were erected. Also, that month, WLW's studio location was moved to 3401 Colerain Ave. WLW presented its inaugural from the new studio on 710 kilocycles with 5000 watts of power at 8:00PM that day. June 1, 1927- The new Federal Radio Commission assigned WLW to operate on 700 kilocycles, dividing time with WMAF at Dartmouoth, Massachusetts and KFBU at Laramie, Wyoming. September 4, 1927- WLW became affiliated with the NBC Blue Network. May 5, 1928- WLW was granted a construction permit to raise power to 25,000 watts regularly and to 50,000 watts experimentally by the FRC. 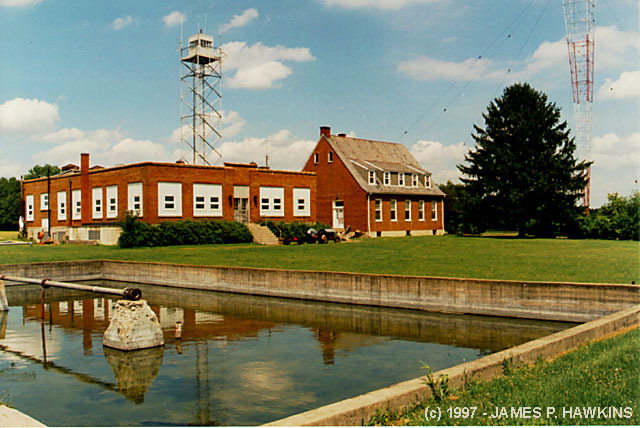 October 4, 1928- WLW closed the Harrison, Ohio transmitting plant, moving the operation to Mason, Ohio, adjacent to the WSAI site there. A new Western Electric 50,000 watt transmitter was installed in a new building built by WLW there. The antenna was a "longwire", running north to south, suspended between two 300 foot towers, 600 feet apart. October 4, 1928-- WLW became the first United States commercial 50 KW station. By the end of that year, four other stations attained the 50 KW power level -- WEAF New York City, WGY Schenactady NY, WBAP Fort Worth TX and KDKA Pittsburgh PA. 1928, thus, became the year of the beginning of regular 50 KW broadcasts. Early 1933- WLW began construction of a new, first-of-its-kind 500,000 watt facility at Mason, Ohio with the approval of the FRC. A new $400,000 RCA 500 KW transmitter was installed at the site and a new 831 foot, 136 ton, half wave, Blaw-Knox double diamond-shaped vertical antenna was erected for $46,000. A 75 feet square, concrete lined pond was built in front of the building for transmitter cooling. Water was pumped through specially designed, water cooled tubes, then out through fountains which sprayed the water into the air and into the pond. January 1, 1934- The FRC authorized WLW to use 500,000 watts on an experimental basis using the call W8XO. April 17, 1934- The FRC issued a license to operate at 500,000 watts during regular hours under the WLW call letters. Wednesday, May 2, 1934- WLW began experimental 500 KW broadcasting as Mrs. Franklin D. Roosevelt threw the switch at the White House desk in Washington D. C. Some saw the WLW call letters as signifying "Whatta Lotta Watts". December 21, 1934- WLW was required to cut back to 50,000 watts during the nighttime hours due to interference caused to CFRB at Toronto, Ontario, about 375 miles away. October 1, 1935- New downtown Cincinnati studios were opened in the Union Central Building Annex. WLW's main studios, including the showplace "Studio A" with its massive pipe organ (dubbed the "Moon River Organ"), remained at 1329 Arlington St. The organ is now located at the Shady Nook Restaurant in Millville, Ohio. October 18, 1935- WLW's 831 tower was struck by an aircraft at the 600 foot level, leaving the tower mechanically undamaged! 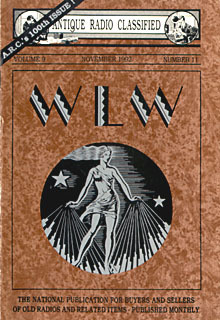 Early 1938- WLW used the air slogan "The Nation's Station". February 28, 1939- WLW reverted back to 50,000 watts of power, ending the superpower experiments, except for the W8XO experimental license, allowing 500 KW operation between 12 midnight until 1:00 AM, which remained in effect until December 29, 1942. September 1945- The Crosley Corporation was sold by the Powel Crosley interests to "The Aviation Corporation", a major industrial manufacturer. Service/News/Talk/Sports" station, with a country music program for truckers after midnight. It runs 24 hours a day and is an affiliate of the ABC Information Network. For more details on this or other radio station histories, you can write to them for a free catalog of historical radio station documents for very reasonable prices. PHOTO GALLERY FROM AN EARLY BROCHURE! Please click on this button if you wish to view 17 rarely seen, historic photos scanned from an early brochure from WLW, provided here with permission from WLW. You can view the gallery, which takes longer to load; or the slide show, which sequences through each individual picture. This Antique Radio Classified cover illustration is from 1930s brochure for the Crosley Corporation radio station WLW. The cover design is reminiscent of the beautiful Art Deco style of its time. This is probably my favorite issue of ARC with two, interesting related articles entitled: WLW - "The Nation's Station" by Dorothy A. Schecter (pg 4), and "Radio Broadcasting in 1925" by Philip Whitney (pg 8). © Copyright 1997 by John V. Terrey. Reprinted with permission of Antique Radio Classified where it appeared as the cover of the November 1992 issue. For a free sample issue write to: A.R.C., Box 2, Carlisle, MA 01741. BACK TO "JIM'S RADIO AND BROADCAST TECHNOLOGY PAGE"
A great Crosley page with numerous photos of radios, ads and other Crosley Collector's items. Moon River Organ - The console and parts of the organ were at the Shady Nook Restaurant, which is now closed. Accessed times since August 24, 1997.